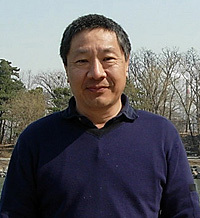 Douglas Lin, professor of astronomy and astrophysics. Photo by Li Shulin. The Division of Physical and Biological Sciences has given its 2007-08 Outstanding Faculty Award to Douglas Lin, professor of astronomy and astrophysics. The award is the division's highest honor, recognizing faculty excellence in research, teaching, and service. Lin is renowned for his research in astrophysics, which has focused on understanding the formation and evolution of stars and planets. He has made significant contributions to the physics of disks of matter orbiting around a central mass, such as Saturn's rings, spiral galaxy disks, and the accretion rings around black holes that power quasars. In a statement announcing the award, Stephen Thorsett, dean of physical and biological sciences, said Lin is "one of the most influential astrophysicists working today" and "the leading theorist in the world in the area of planet formation." Lin is regularly asked to summarize the field of planet formation, giving an average of one invited talk every six weeks. Last year he was appointed as the founding director of the new Kavli Institute for Astronomy and Astrophysics at Peking University in Beijing, China. Lin is regarded as an excellent professor by undergraduates and graduate students alike. "He is often described by his students as extremely knowledgeable, enthusiastic, well-organized, humorous and one who arouses in them a keen interest in the subject matter," Thorsett said. Lin earned his B.S. from McGill University and his Ph.D. in astronomy and astrophysics from Cambridge University. He joined the UCSC faculty in 1979.